Our Asado, which brings the warmth and hospitality of South America to Napa, has become TasteVino Selections Wine Club’s annual signature event. 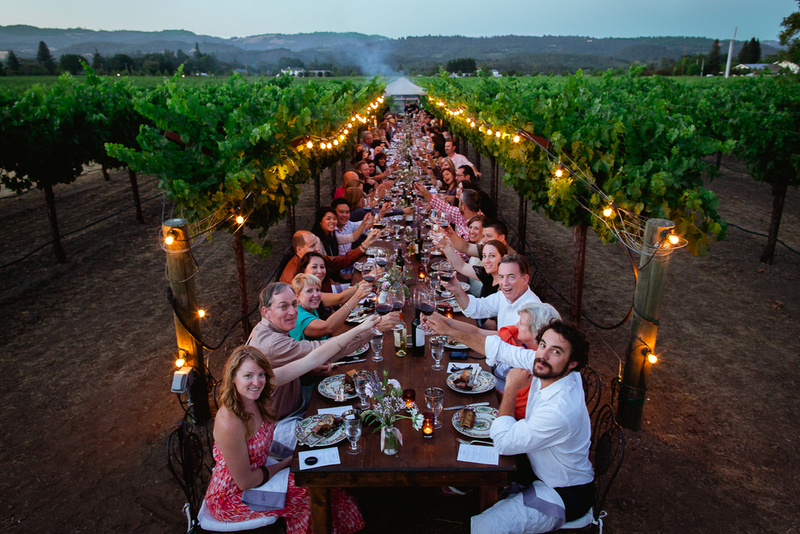 During this year’s celebration – our fourth – we enjoyed the feast created by SMOKE Open Fire Cooking while catching up with wine club members, both old and new, as we all shared in the magic of this very special summer feast. Each year Irma comes up with a fresh take on the Asado; this time, she reflected on our 2007 visit to San Telmo, the “Latin Quarter” of Buenos Aires, as a theme. The Old World charm of that neighborhood was reflected everywhere, from the ornate antique elegance of the café chairs to romantic refrains of the live tango music – all set in the unique beauty of a private estate, the vineyard property of our dear friends Jamie and Bernie Hurley. Our guests ranged from founding members of TasteVino Selections Wine Club; to friends of prior Asado attendees, as well as new TasteVino fans and SMOKE followers; and also several friends of our creative director-photographer Quentin Bacon, whose past Asado imagery they have been following for several years. An Asado is the ultimate mixed grill, and as you can see there is never a shortage of meat at my version of this feast. Irma made sure there was plenty of wine also, starting with Cinco Sentidos Extra Brut; moving to Inspiratto Malbec from our latest club shipment, and ending with Pueblo del Sol Reserve Cabernet and Cinco Sentidos Gran Reserva with Stewart Ranch Lamb. I love letting the season’s bounty guide my salads, and guests particularly enjoyed my Grilled Peaches and Burrata with Arugula Salad. This is what Napa brings to the Asado – incredibly fresh ingredients. We finished the meal with Braised Rice Pudding with Dulce de Leche & Macerated Cherries, paired with a glass of Familia Deicas Dessert Wine 2007. This year’s Asado was the kind of heady evening where you might just break into song – as did our native Argentinean friend, Gustavo Bustos, guest of Matias Bertona. What would you sing at the end of a night like this?